The Center for Sight & Hearing 2017 Volunteer of the Year is Terry Gobin. 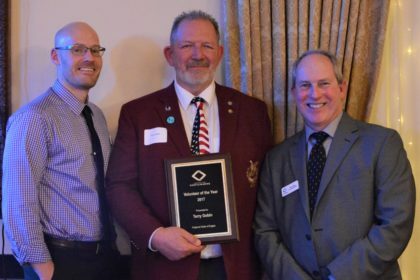 Terry is being recognized for his outstanding support for CSH during his time as the Illinois State Fraternal Order of the Eagles President. Under Terry’s leadership, the Eagles clubs across the state raised and donated $30,000 to CHS, $19,000 of which is earmarked for the expansion of the CSH Vision Clinic. “When Terry and his wife, Sandy, came to CSH almost two-and-a-half years ago for a tour, I had no idea it would lead to all the support we’be received from the Fraternal Order of Eagles,” said Tom Lasley, vice president of development. Terry chose CSH as his project because of three people who have influenced his life: a teacher in Byron who taught Terry, through a book by Helen Keller, that adversity is no reason to give up; a close friend who went blind at the age of 28 while in the Marines; and a granddaughter who is diabetic. “Terry and Sandy are so kind, generous, and true community supporters for not only the Center for Sight & Hearing but other organizations as well,” stated Dr. David Powell, CSH vice president of professional services. The time and efforts that Terry has generously given to CSH will help expand the low vision clinic and greatly benefit the people we serve. Thank you, Terry, for all you’ve done for the Center for Sight & Hearing and our community.